The other day I was talking with a friend about different things you can wish on. Ever since I was a little kid, if I look at a clock and it’s 11:11, I make a wish. I don’t know why I started doing this, or what basis it has, but ever since I can remember I’ve done it. One time that I specifically remember my wish came true. I was in eighth grade and we were receiving our roles for the upcoming class play. I was really hoping to get a main part, because I was (still am?) an overachiever and liked to be the best at everything. However, I got a secondary part with not (in my opinion) a lot of lines. I was really bummed. I looked at the clock and it was 11:11. So I wished that the teacher would give me another part (it was the kind of play where one actor could play multiple roles). At the end of the day, after the first read through, the teacher pulled me aside, and explained that one of my classmates probably wouldn’t be able to handle one of the parts she had given him, and gave it to me! I was so happy. My wish had come true. I realize that this was probably a huge coincidence, but there is a small part of me that still believes in wishing. It’s my one superstition. I don’t care about the number 13 (I live on the 13th floor and often sit in row 13 on airplanes and I will take the GRE on December 13th), I own a black cat, and I broke a mirror when I was 16 and didn’t have bad luck for seven years. Here is a list of things that I have or still do wish on. In the U.S., when you have a loose eyelash on your face, you put it on the tip of your finger, make a wish, and blow. If the eyelash blows away, your wish will come true. If not, it won’t. In Chile, when you have a loose eyelash, you have someone else squeeze it between their index finger and thumb. Then they say “arriba o abajo” (above or below) and you choose one. If they eyelash sticks to the side you’ve chosen, your wish will come true. If your necklace clasp is in the front instead of the back, you can make a wish as you put it back in its rightful place. As kids, my siblings and I would always fight over who got to make a wish on the wishbone at Thanksgiving. You need two people, and they each make a wish while each holding a side of the wishbone. Then they pull until it breaks. Whoever gets the bigger half gets their wish granted. It’s been awhile since I’ve had candles on a birthday cake. Is it one wish or three? Anyway, you either make one wish or three wishes before blowing out the candles. You have to blow them all out. The number of candles left lit is the number of children you’re going to have, apparently. 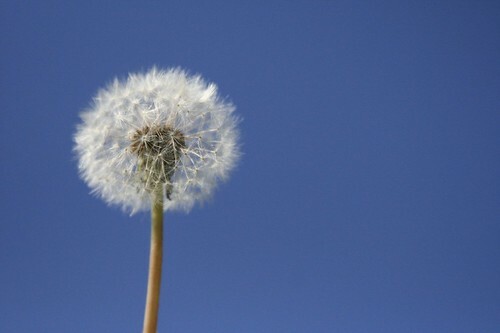 When dandelions go to seed, you can pick them up and try to blow away all of the little seeds. The idea is the same as the birthday candles, you have to blow all of the seeds in one breath. Star light, star bright, first star I see tonight. Wish I may, wish I might, have the wish I wish tonight. Also, shooting stars. And no, Haley Williams, we cannot pretend that airplanes are shooting stars. That would be cheating. This entry was tagged 11:11, dandelions, eyelashes, make a wish, wishes. Bookmark the permalink. I believe in the four-leaf clover because I found one once as a child and wished that I would win every time with our new board game (The Game of Life). I won about five games in a row but then my sister refused to play with me after that! I have never found a four leaf clover 😦 My neighbor growing up could casually glance down at a patch of clover and find one. I was always envious! What about oreo cookies?! You pull them apart with someone and if you get the bigger half with more cream your wish comes true! Yes! I had forgotten all about this one! I used to do it all the time as a kid. I’ve heard of this too! A coworker did it the other day when we were eating cherries. If I remember, I try to make “rabbit rabbit” the first thing i say when I wake up on the first day of a month…I guess it is supposed to give you good luck for the month. I usually forget though. Yes! I’ve heard of this too. I also always forget.